The Northwest Chapter's two main events are the annual Spring Rendezvous and the annual Fall Meet. 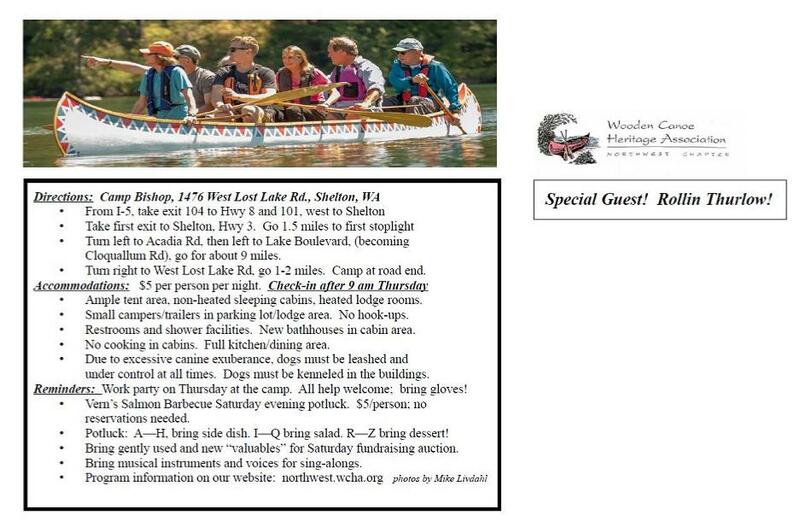 These are occasions for wooden canoe owners and enthusiasts to gather at one location in the Pacific Northwest and experience a full weekend immersed (usually not literally!) in everything related to wooden canoes. While the size of the Spring Rendezvous has increased since beginning in 1995, the Fall Meet remains the largest and, for many, the most important function of the Chapter. For some pictures of past spring and fall meets see the Past Events page. Also check out the current Newsletter (pdf format) detailing past events and canoe related articles. From 1-5, take exit 104 to Hwy 8 and 101, west to Shelton. Take first exit to Shelton, Hwy 3. Go 1.5 miles to first stoplight. Cloquallum Rd), go for about 9 miles. Turn right to West Lost Lake Rd about 1-2 miles. Camp at road-end. Rollin Thurlow will be joining us this year as our very special guests at Camp Bishop. Thursday, May 9th may be a work day around Camp Bishop, we are waiting to have confirmation on what Thursday will be.